Looking for a great get away at a bed and breakfast in or around Qualicum Beach? You don’t have to look far to find one that suits your taste. There are quaint homes that offer excellent hospitality as well private guest cottages. It all depends on what suits you. Sometimes its great to be able to land in at a bed and breakfast and genuinely feel that the proprietors whose home you are staying in truly want to make you feel comfortable and “at home” in their home. This is the one trait that makes the bed and breakfast experience an enjoyable one. 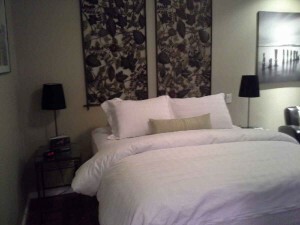 After all, what you really expect is a comfortable environment and a comfortable bed. The inns and cottages that offer a more distinctly private experience differ mainly in that the proprietors are more likely to offer a bit more consistency. Along with the many amenities offered, you will likely find a bit more comfort as well. The bed and breakfast is really just that: a bed and a breakfast. The cottage or guest house likely prides itself on a more luxurious experience, tailored to a specific level of expectations. Suite Amour Hobby Farm and B&B, located just outside Qualicum Beach, consists of 2 well designed guest cottages, aptly named after each of the 2 horses, and offers both a luxurious and private experience. The serene settings of a the hobby farm give a whole new meaning to the word relax. Watching the beautiful quarter horse, named Emmy, along with her miniature show horse Mira grazing peacefully in their pasture, gives you a sense that all is right and there is time for doing nothing. Although Suite Amour is a bed and breakfast, you actually have the option of having a sumptuously prepared breakfast, or just taking care of the breakfast part yourself. Each cottage is equipped with a kitchenette, microwave and toaster oven, dishes and cutlery, pots and pans. Having the option of having a breakfast or not can be a very convenient option for people who like to have the choice. Sometimes, you just want to start your day early and don’t want to take a leisurely breakfast. If you are visiting the Parksville and Qualicum Beach area of Vancouver Island, consider staying a few days at Suite Amour Hobby Farm and B&B. Lovely, modern little cabins on a tranquil acreage overlooking a pond and the prancing horses. I’d definitely stay here again. Wonderful Reviews from a few of our recent guests! My wife and I stayed here and it was one of the most relaxing getaways we’ve had before. We got a beautiful breakfast and were treated to the best scones I’ve ever tasted. Great host, very clean and spacious cabin, and lots to see in area. Also super quiet in the area so it’s so peaceful. Thanks Judy!